Well, we were stuck in the kitchen on the hottest weekend of the year! With two catering ovens and an electric plate warmer, my fabulous team and I worked tirelessly over two days to provide an array of summer food for a quintessentially English wedding. 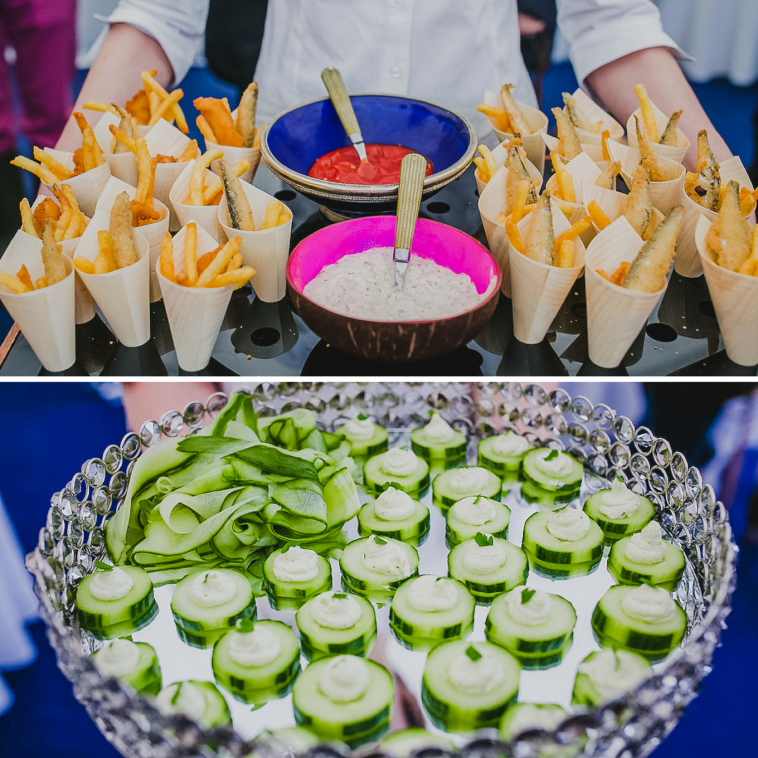 The canapés before dinner were a selection of Thai Crab Cakes with a Sweet Chilli Dipping Sauce, Fish and Chips with Tomato Ketchup & Homemade Tartare Sauce, Smoked Salmon Mousse on cucumber boats, alongside local asparagus served with a homemade hollandaise. Don’t they look glorious?! But moving on from those gorgeous canapés, what meal did the guests sit down and get tucked into? On this occasion I turned to Mary Berry’s Chicken with Taleggio, Pesto, Breadcrumbs & Vine Tomatoes, which we served for the main course. It’s always good to have recipes like this up your sleeve for a spot of effortless entertaining. 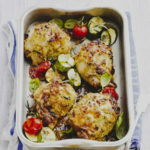 This simple baked chicken dish has bags of summery flavours packed into it and doesn’t easily dry out, which is perfect when you’re cooking on a large scale. We plated it up individually for guests, but I think it looks gorgeous for less formal occasions served straight from the tray in the middle of the table. Pre-heat the oven to 220C, 200C fan, 425F, Gas 7. Arrange the chicken breasts in a single layer in an ovenproof dish or roasting tin and season with salt and freshly ground black pepper. Mix the Taleggio, pesto, basil and cream cheese in a bowl and season with salt and freshyl ground black pepper. Spoon on to the chicken breasts, spreading the mixture out to cover them completely. Sprinkle with breadcrumbs and dust with a little paprika. 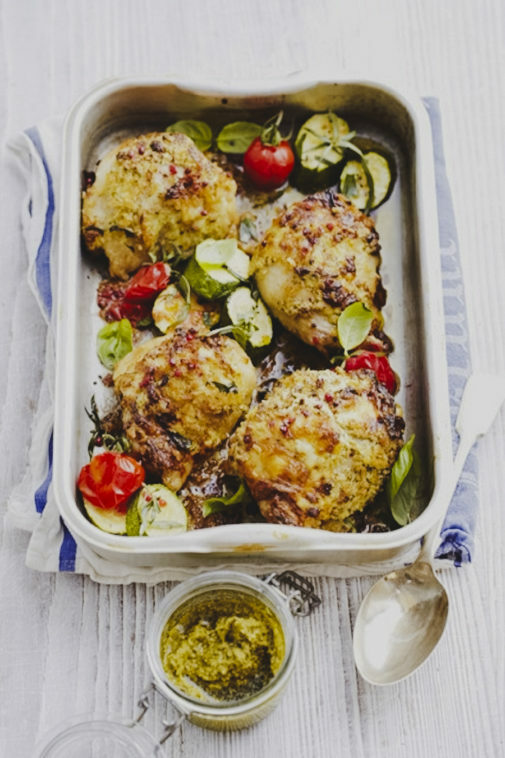 Bake for 20 mins, then arrange the tomatoes around the chicken, pour the oil and vinegar over them and return to the oven for a further 10 minutes or until the chicken is just cooked through. Be careful not to over cook it. 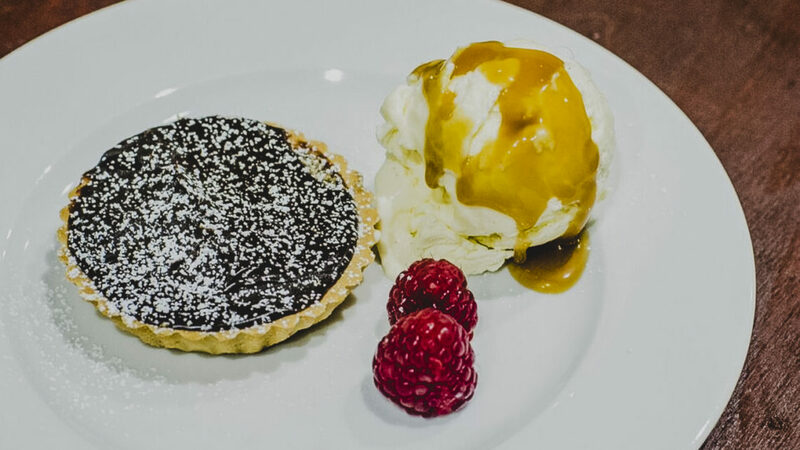 Wedding desserts need a bit of wow factor, and I think the Salted Chocolate Tart with Vanilla Ice Cream looked so pretty on the plate! 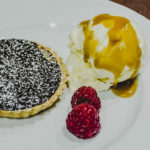 This really is one of the easiest puddings in the world to make, with the help of ready-made pastry, so again it’s a great recipe to have in your reportoire for dinner parties. The easiest pudding in the world thanks to my cheat of using ready-made dessert pastry! Preheat your oven to 180C/160C fan/Gas 4. Roll out the pastry and line a tart tin, approximately 23cm. Line with some scrunched up baking parchment and fill with baking beans. Bake blind in the oven for 10-15 mins, then remove the baking beans and continue to bake for about 10-15 mins, until the pastry is a pale biscuit colour. In a pan, bring the cream, sugar and salt just to scalding point – where the mixture is just about to boil, then turn off the heat. Off the heat add the broken up chocolate and butter and stir well to combine. After about 10 minutes, add the milk and stir well, then leave to cool. Chill this mixture for a couple of hours before pouring it into the pastry case, then chill again until it is completely set. Serve with a small sprinkle of sea salt, some vanilla ice cream and a few raspberries. I always use Bourneville chocolate as this doesn’t split, it seems to handle the heat better! This tart is best served straight from the fridge, otherwise it is way too rich and quite impossible to cut and serve neatly!! I hope you enjoy both of these recipes and keep them filed for any summer dinner parties you’ve got coming up.